A three dimensional cutting machine, manufacturer rated for products input sized up to 5.5 inches (140mm) in any dimension. Manufacturer recommends for uniform dices, strips, and slices from a variety of soft ripe fruits and brittle root vegetables, such as potatoes, beets, lettuce, cabbage, broccoli, cauliflower, sweet potatoes, squash, carrots, mushrooms, turnips, cantaloupe, endive, tomatoes, cucumbers, horseradish, apples grapefruit, citrus peel, papaya, pineapple, peaches, celery, rutabagas, melon rind, and many other foods; producing clean, uniform, high-quality tons-per-our output. Slice thickness: From 1/8 inch / 3.2mm, up to 3/4 inch / 19.1mm, (knob adjustable). Circular knifes: from 1/8 inch (3.2mm) to 3 inches (76mm); (spacers and number of knives determine). Crosscut knife spindle (change part) spacing: from 3/4 inch (19.1mm) up to 1.75 inches (44.5mm). By removing the crosscut knife spindle and / or the circular knife spindle(s), the Urschel HA dicer can also cut strip cuts (two-dimensional cuts) such as for french fries, and slices (single dimensional cut). An optional "G" kit is available to extend the range of this machine to overlap with the Urschel model G, and we can otherwise complete this machine with cutting parts to buyer specification: Please call 315-589-4511 to discuss your particular food process cutting machine need! Stainless steel product contact surfaces, including slice shell and impeller with 10 inch slice shell opening, cutting spindles and knives. USDA sanitary model designation with food grade stainless steel construction including spindle arms, guards, shrouds and tubular stainless steel frame. Factory control box with safety interlock system. Standard 2 HP 208/230/460 volt 3 phase drive. 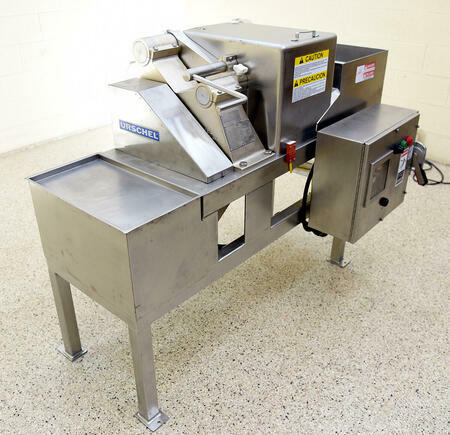 As of this writing, this reconditioned Urschel dicer is in stock, in EXCELLENT operational, mechanical, electrical and cosmetic condition, needing only to be fitted with cutting parts to buyer specification prior to a timely shipment. CALL 315-589-4511 to confirm availability, and to discuss your particular industrial food process cutting machine needs. This page contains a single entry by Michael C. Shults, Alard Equipment Corp published on January 29, 2019 4:21 PM. Urschel OC SLICER, Alard item Y2562 was the previous entry in this blog. 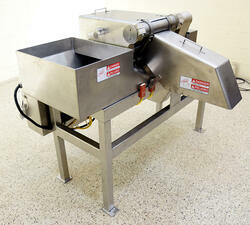 Urschel G-A DICING MACHINE, Y4148 is the next entry in this blog.